Down on the lower end of the spectrum for Nvidia's Pascal based GPUs, are the GTX 1050 and GTX 1050 Ti. They've essentially replaced the GTX 960 and GTX 950 from the 900-series with parts that consume less power and are cheaper to manufacture. The older cards have more CUDA cores, however the newer ones are clocked higher. Nvidia's new budget cards are roughly equivalent in performance to their predecessors, but you'll find them for way cheaper. Running on the GP107 architecture and 14nm process compared to the GP106 and 16nm on the other 10-series cards, the GTX 1050 Ti is smaller and uses less power. Despite lower clock speeds than the equivalent 900-series GPUs, the GTX 1050 Ti is better at managing memory bandwidth. The smaller size benefits you by making the card way cheaper than graphics cards from a couple of years ago. So, if you're looking for some decent gaming performance around the $150 to $175 mark, the GTX 1050 Ti is a good option for you. The 4GB of GDDR5 VRAM is pretty good for a budget card, and you'll find a memory speed of 7Gbps on the reference card from Nvidia. The base clock on the reference card is 1290MHz, and the boost clock is 1392MHz. Below you'll find the best deals on the Internet from the various GTX 1050 Ti manufacturers. They'll mostly have custom specifications, including higher clock speeds and the company's own cooling system. The most EVGA is squeezing out of a GTX 1050 Ti is a base clock of 1379MHz and a boost clock of 1493MHz. The FTW edition doesn't alter the memory at all, but it does have EVGA's custom ACX 3.0 cooler, which it says has a 400 percent longer lifespan than its competitors, uses four times lower power, is 10 percent cooler than ACX 2.0, and 52 percent quieter than the reference cooler. Zotac's GeForce GTX 1050 Ti OC Edition pumps up the card to a pretty beefy base clock of 1392, which is the same as the boost clock on the reference card. The boost clock on Zotac's is all the way up at 1506Mhz, while the memory remains untouched. This one has a dual fan cooling system, but Zotac also has a Mini edition featuring just a single fan and a slight overclock. 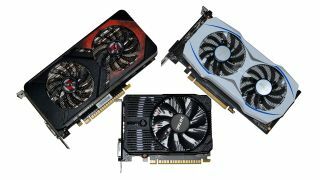 MSI has a whole bunch of GTX 1050 Tis available, with an array of dual and single fan cooling designs. The Gaming X 4G has three running modes, much like the manufacturer's other cards. Silent Mode keeps things running quietly while sacrificing some performance, there's a Gaming Mode for the middle ground, and an OC Mode for when you want the most out of it. In OC Mode, you'll be getting 1379 / 1493MHz base / boost clock, and the memory is pumped up to 7108MHz too. Of the several GTX 1050 Tis Asus has for sale, the RoG Strix O4G Gaming has the most impressive stats. In the default gaming mode it's got a base / boost clock speed of 1379 / 1493MHz, which is impressive enough on its own. However it also has an OC Mode taking the specs up to 1392 / 1506MHz base / boost clock speed just for that little extra performance. Gigabyte has a similar selection to Asus, with a handful of cards ranging up to the GeForce GTX 1050 Ti G1 Gaming 4G. In its standard mode it's got a base / boost clock of 1366 / 1480MHz, which is slightly less than the Asus card above. However in OC Mode the specs are exactly the same at 1392 / 1506MHz. Neither card has their memory clock speed adjusted. Inno3D has a couple of GTX 1050 options available, with one being the tiny Compact card with just a single fan running at the reference speeds of 1290 / 1392MHz base / boost clock, and memory speed of 7Gbps. The dual fan Twin X2 also runs at the reference speeds, but has the added cooling the extra fan provides. Palit also has a couple of options available, but it does have an overclocked version of the GTX 1050 Ti. The Dual OC has a base / boost clock speed of 1366 / 1480MHz and a couple of TurboFan blades keep this 2 slot card cool. The StormX also has an improved cooling system, but there's only one fan and the card runs at the reference specifications.